As always, my first passage is a bit cryptic, but the riddle will be solved. During the last week I learned to sew a sweater, namely the Toaster Sweater 1. I found this lovely cropped sweater per chance on Instagram and I loved the model in it. The long cuffs and the big waistband, the turtleneck and raglan sleeves, the stiff fabric and naturally the colour pink – I was smitten. Maybe the medication lowered my inhibition (you remember, flu, fever…?) but I instantly bought this pattern. As it is a pdf pattern, it really was instantly. I glued the 32 pages together (HATE) and had the pattern ready. By the way: here is my one and only critic of this pattern: although I tested if my printer is calibrated, the lines on the paper did not fit perfectly. Next step was choosing a size (L) and cutting the fabric. As this is my first real sweater, I as always used cheap fabric. It is a thin knitted fabric with autumnal colours or, so I try to sugar-coat my strange fabric purchase. As this fabric is a piece out of the scrap box of the shop I did not have the recommend amount of 1,5 x 1,8 m fabric (much less: I had 1,4 x 1,1 m). 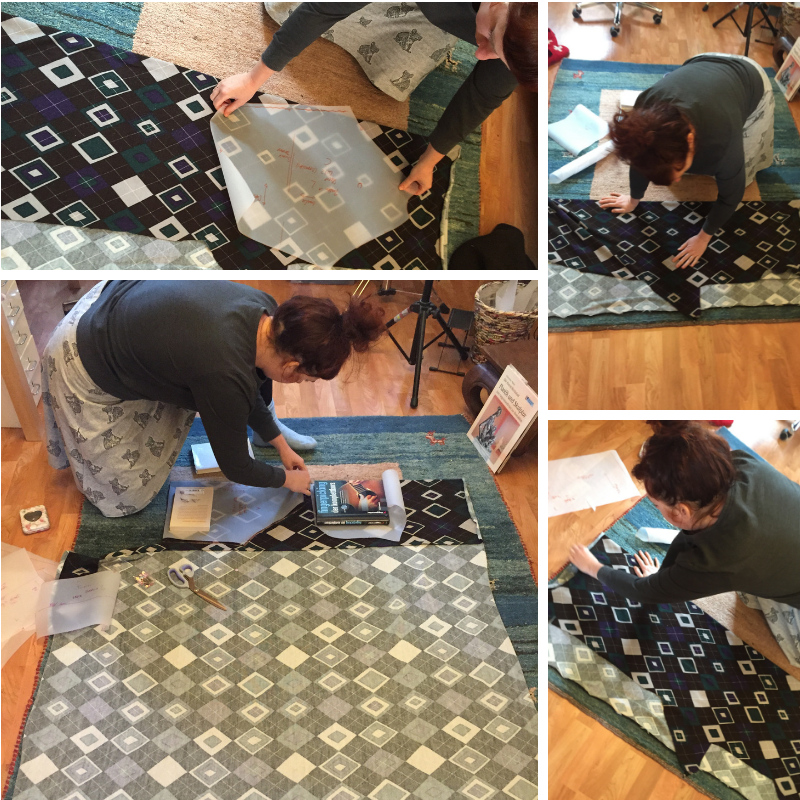 This led to contorted movements on the floor to get the pattern fitted on the too small fabric… and no wonder, it did not fit. I changed the size of waistband and cuffs and tada, the fabric sufficed. The next steps were pinning and sewing. As I do not have a overlock sewing machine, I used a stretchy three-step zig-zag stitch. 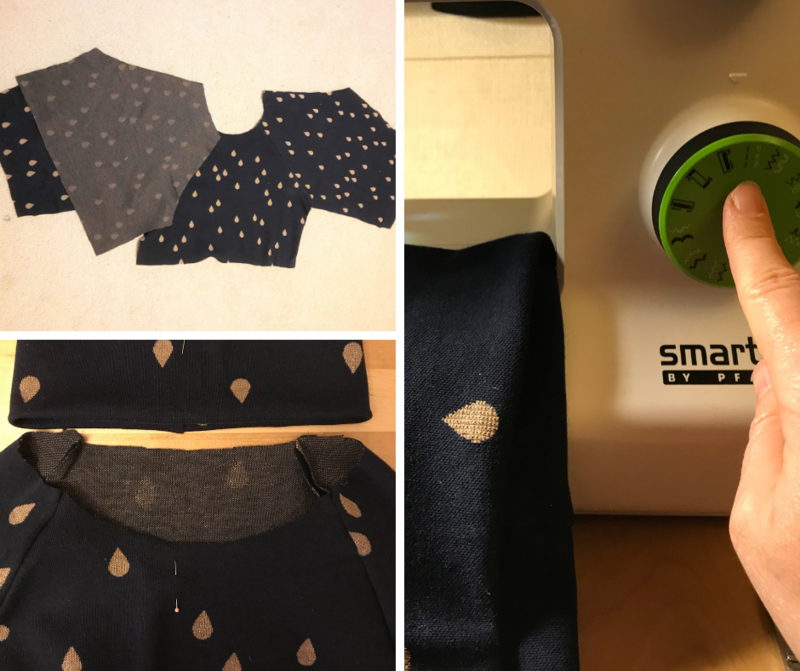 The explanation of the pattern is super clear and I was able to understand everything without searching for a YouTube tutorial. But as you can see it is too wide and too long. So on to the next the cold my brain told me in size M. And again, I used a scrap fabric. But this time it was a fabric which I eyed forever in the shop, but it was much too expensive. But lucky me I found a rest some weeks ago in the summer sale. Again, not so much as the pattern called for, but now I was prepared to puzzle it out … or so I thought. I nevertheless finished the sweater and I am so happy with it. 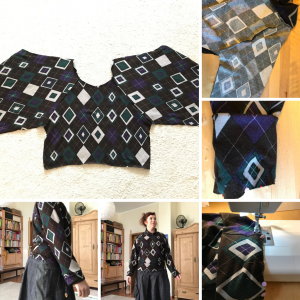 I made some small modifications to size M – I shortened the sleeves and the body about 3 cm and it fits (for my taste) perfectly. Thank you @crosheille and @crystalize for hosting the #needleworkmonday. If you want to see more beautiful projects with yarn, fabric and most of all needles, follow @needleworkmonday. 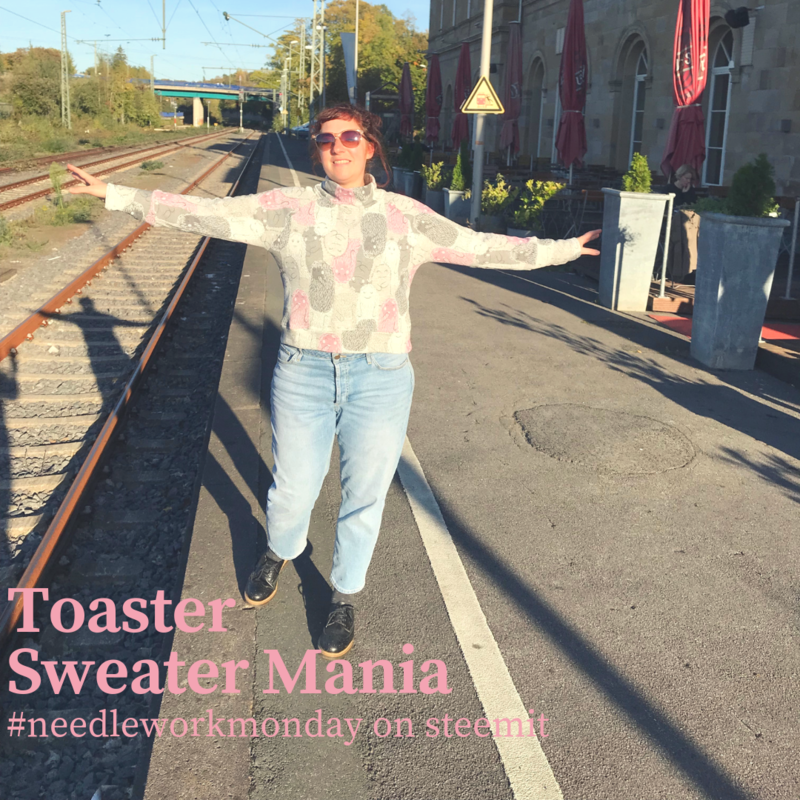 Or even better grab your needles and keyboard and join the #needleworkmonday community on steemit. If you want to read all #needleworkmonday comments go and visit my steemit blog.